A Palestinian civilian was killed while 32 others were wounded in al-Fawar refugee camp, south of Hebron. A Palestinian civilian was wounded in the eastern side of al-Bureij in the Central Gaza Strip. Israeli forces conducted 68 incursions into Palestinian communities in the West Bank and 5 ones in Jerusalem. 73 civilians, including 5 children, a woman and a Hamas leader, were arrested. 29 of them, including 3 children and a woman, were arrested in occupied Jerusalem. Israeli forces continued to impose collective punishment measures against Palestinian civilians. A residential room and car shop were demolished while al-Khan al-Ahmar Primary School was closed. Two barracks were demolished in Eastern Barta’ah village, west of Jenin. 3 houses were demolished behind the annexation wall in Beer ‘Awnah area, north of Beit Jala. 7 houses and a barrack were demolished in Hebron in addition to an agricultural room in Nablus. 10 fishermen were arrested and two fishing boats were confiscated in the northern Gaza Strip. 9 Palestinian civilians, including a girl and woman, were arrested at military checkpoints. Israeli violations of international law and international humanitarian law in the oPt continued during the reporting period (11 – 17 August 2016). Israeli forces have continued to commit crimes, inflicting civilian casualties. They have also continued to use excessive force against Palestinian civilians participating in peaceful protests in the West Bank and Gaza Strip, the majority of whom were youngsters. 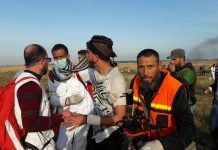 During the reporting period, Israeli forces killed a Palestinian civilian and wounded 32 others in al-Fawar refugee camp while they wounded a Palesitnian civilian in the Gaza Strip. In the Gaza Strip, Israeli forces continued to target Palestinian fishermen and chase them in the sea. In the West Bank, on 16 August 2016, in new excessive use of force, Israeli forces killed Mohammed Yousif Abu Hashhash (19) when they moved into al-Fawar refugee camp, south of Hebron. The aforementioned civilian was killed when the Israeli soldiers opened fire at him from a distance of 40 meters through a hole caused by the soldiers in the wall of a house belonging to Bajes al-Hmouz. The aforementioned was on his way out from a residential building where his uncles and grandmother live. The bullet entered under his left armpit and settled in his body. As a result, he was taken to the Palestine Red Crescent Society (PRCS) in the camp and was given first aid and CPR. One of the paramedics classified his wound as very serious. Abu Hashhash then passed away as the bullet settled and he suffered internal bleeding. The clashes, which broke out all day between the Palestinian protesters and Israeli forces, resulted in the injury of 32 civilians with live bullets in different parts of their bodies. In the Gaza Strip, on 12 August 2016, a Palestinian civilian sustained a live bullet wound to his left foot when dozens of youngsters and children headed to the border area, east of al-Bureij neighbourhood, and threw stones at Israeli soldiers stationed behind the border fence. Israeli forces stationed behind sand barriers in response fired live ammunition and tear gas canisters at them, wounding the aforementioned civilian. In the context of targeting Palestinian fishermen in the sea, on 11 August 2016, Israeli gunboats stationed off al-Wahah shore, northwest of Beit Lahia in the northern Gaza Strip opened fire twice towards the Palestinian fishing boats sailing within 2 nautical miles. However, neither casualties nor damages to the boats were reported. On 12 August 2016, the shooting recurred at the Palestinian fishing boats sailing within the same area. During that, the Israeli forces arrested 5 fishermen, including a child, after confiscating their boat. On 15 August, a similar shooting occurred in the same area resulting in the arrest of 5 APlestinian fishermen. They were taken to Ashdod Seaport and their boat was confiscated. After questioning them, two of the fishermen were released whole the rest 3 were still under arrest. Moreover, the boat is still in custody. In the two aforementioned shooting incidents, the two fishing boats were sailing within 4 nautical miles. During the reporting period, Israeli forces conducted at least 68 military incursions into Palestinian communities in the West Bank and 7 ones in occupied East Jerusalem and its suburbs. During these incursions, Israeli forces arrested at least 73 Palestinian civilians, including 3 children and a woman. Twenty-nine of them, including 3 children and a woman, were arrested in occupied Jerusalem. Among those arrested was Hussein Abu Kweik, a Hamas Leader and their representative in the Central Elections Commission (CEC), who arrested from his house in Bitounia village, west of Ramallah. In the Gaza Strip, on 15 August 2016, Israeli forces moved 100 meters into the eastern side of Khuza’ah village, southeast of Khan Younis in the southern Gaza Strip. They levelled lands along the border fence between the Gaza Strip and Israel to the north and after hours redeployed along the aforementioned border fence. On 15 August 2016, Israeli forces moved into Bani Na’im, east of Hebron, and stationed in the eastern side of the village. They raided a house belonging to the family of Naser Mohammed Tarayrah (50), whose son stabbed to death a female settler in her house in “Givat Kharsina” settlement on 30 June 2016 and he was killed as well. Explosive engineering teams transplanted explosive devices in the first floor of the house and then exploded it remotely. As a result, the windows of the nearby houses were destroyed. It should be mentioned that the 2-storey house is built on 200 square-meters, and due to exploding the first floor the second floor was cracked. Concerning house demolitions and demolition notices, on 15 August 2016, Israeli forces closed al-Khan al-Ahmar Primary School in the Bedouin communities established in the eastern side of occupied Jerusalem, claiming that the school is not in a hygienically safe environment with Area (C) under the Israeli control. On 16 August 2016, Israeli municipality bulldozers destroyed a room and fences in Khelet ‘Abed area in al-Sal’ah neighbourhood al-Mukaber Mount village, southeast of occupied East Jeruslaem. This property belongs to Mohammed ‘Abeidat under the pretext of building without a license. On the aforementioned day, Israeli bulldozers demolished a commercial facility in ‘Anat village in occupied Jerusalem. This facility belongs to Zakariah Mousa and was demolished under the pretext of building without a permit. The illegal closure of the Gaza Strip, which has been steadily tightened since June 2007 has had a disastrous impact on the humanitarian and economic situation in the Gaza Strip. The Israeli authorities impose measures to undermine the freedom of trade, including the basic needs for the Gaza Strip population and the agricultural and industrial products to be exported. For 9 consecutive years, Israel has tightened the land and naval closure to isolate the Gaza Strip from the West Bank, including occupied Jerusalem, and other countries around the world. This resulted in grave violations of the economic, social and cultural rights and a deterioration of living conditions for 1.8 million people. The Israeli authorities have established Karm Abu Salem (Kerem Shaloum) as the sole crossing for imports and exports in order to exercise its control over the Gaza Strip’s economy. They also aim at imposing a complete ban on the Gaza Strip’s exports. The Israeli closure raised the rate of poverty to 38.8%, 21.1% of which suffer from extreme poverty. Moreover, the rate of unemployment increased up to 44%, which reflects the unprecedented economic deterioration in the Gaza Strip. In the context of Israeli settlers’ attacks in the city, on 14 August 2016 hundreds of settlers raided al-Aqsa Msoque in the Old City of East Jeruslaem. This came under the Israeli forces’ protection to commemorate “Tisha B’Av”. On the same day, 3 settlers severely beat up ‘Abdel Rahman Shweiki (13) while selling bagel in front of al-Hilweh Valley neighbourhood in Silwan village, south of Jeruslaem’s Old City. The settlers were in a vehicle when the child was on the street. They then stepped out of the vehicle and talked with him in Hebrew. One of the settlers tore up the child’s shirt and pushed him to the ground. They started punching him on the face and kicking him on the shoulder. On 15 August 2016, Israeli forces levelled two sheds in Eastern Barta’ah village, which isolated from its surroundings due to the annexation wall, west of Jenin. The first barrack used as a granite factory belongs to Walid ‘Ajaj from Sayda village, north of Tulkarm, while the second barrack belongs to Rami al-Ayoubi from Kafr Qassem. The Israeli forces confiscated from the first barrack an air pump, forklift and tractor. On 16 August 2016, Israeli bulldozers demolished 3 houses belonging to Mousa Mohammed Ahmed Zreinah behind the annexation wall in ‘Oanah area, north of Beit Jala. The first and second houses are built on an area of 120sqaure meters while the third house is a 45-square-meter room. It should be mentioned that 20 persons live in these houses. On the same day, Israeli forces demolished 7 houses and a barrack used to shelter sheep in Kherbet Joret al-Kheil, east of Sa’ir village, east of Hebron. The number of family members affected is 42, including 20 children. On 17 august 2016, Israeli forces demolished an inhabited house in Ras al-Aqra’a area, southwest of Douma village, southeast of Nablus. The 100-square-meter house belongs to Tariq Sidawi and is ready for housing. Moreover, the Israeli forces levelled an agricultural room in Marah Ethnein area, south of Qasrah village, southeast of Nablus, belonging to Samir Ibrahim Mustafa Hasan. In the same context, on 13 August 2016, Israeli settlers protected by Israeli soldiers moved into the antiquities area in Sibistia village, northwest of Nablus. The settlers performed religious and Talmudic rituals in the aforementioned area until next day dawn. At approximately 00:30, Israeli gunboats stationed northwest of Beit Lahia, north of the Gaza Strip, sporadically opened fire at Palestinian fishing boats sailing within 2 nautical miles. As a result, the fishermen were forced to flee for fear of being arrested or wounded. At approximately 01:00, a special force of Israeli soldiers known as undercover units sneaked into the centre of Jenin. They surprised Suhaib Yousef Salem al-Sa’di (23) and Abed al-Rahman Qasem Raghib al-Sa’di (29) while they were in front of the Grand Mosque in the center of Jenin, and arrested both of them. In the meantime, Israeli forces accompanied with military vehicles moved into Jenin in order to help the undercover unit to get out of the city. They then took the arrested persons to an unknown destination. At approximately 02:00, Israeli forces moved into Bethlehem and stationed in al-Mawaleh Mount in the center of the village. They raided and searched a house belonging to Suhaib Saleh Qasem (37) and arrested him. At approximately 03:00, Israeli forces moved into Beit Fajjar, south of Bethlehem. They raided and searched a house belonging to Mahmoud Diryiah and arrested his son, Hany (18). At approximately 07:30, Israeli gunboats stationed northwest of Beit Lahia, north of the Gaza Strip, sporadically opened fire at Palestinian fishing boats sailing within 2 nautical miles and chased them. As a result, the fishermen were forced to flee for fear of being arrested or wounded. Note: During the aforementioned day, Israeli forces conducted (5) incursions in the following areas and no arrests were reported: Dura, Deir Samet, al-Koum, Deir Razieh and Tafouh ‘Awad village in Hebron. At approximately 02:00, Israeli forces moved into Beit Fajjar village, south of Bethlehem. They raided and searched a house belonging to Akram Taqatqah and handed his son, Monther (22), a summons to refer to the Israeli Intelligence Service in “Gush Etzion” settlement, south of the city. Around the same time, an Israeli infantry unit comprised of 12 Israeli soldiers moved into Silwad village, northeast of Ramallah. They raided and searched two houses belonging to Hasan Abed al-Kareem Hamed and Mousa Yasir Hamed. Mousa was released from the Israeli jails 5 days ago. The Israeli soldiers handed both of them summonses and later withdrew. At approximately 02:30, Israeli forces accompanied with military vehicles moved into Hebron and stationed in al-Namirah and Abu Katilah neighborhoods and al-Hariya Valley. They raided and searched houses from which they arrested 4 civilians. The arrested persons were identified as Hazem Ghalib Niroukh (29), Hafiz Nidal Nasir al- Deen (25), Shadi Mousa Abu ‘Ajimah (30) and Rafat Rafeeq al-Haymoni (28). Around the same time, Israeli forces moved into ‘Asirat al-Qabaliya village, south of Nablus. They raided and searched a house belonging to Omar Mohamed Saleh (24) and arrested him. At approximately 07:00, Israeli gunboats stationed northwest of Beit Lahia, north of the Gaza Strip, heavily opened fire at Palestinian fishing boats sailing within 4 nautical miles. Two Israeli gunboats approached a fishing boat manned by 5 fishermen, who were identified as Said Jum’a Hasan Baker (47) and his two sons Mahmoud (18) and Ibrahim (16); Yasir Nasir Fadel Baker (24); and Ahmed Mahmoud al-Louh (20). All of the fishermen are from al-Shati’ camp, west of Gaza City. Israeli navy forces obliged the fishermen to take off their clothes, jump into the sea and swim towards the two gunboats. After that, the fishermen were arrested and taken to an unknown destination and their fishing boat was confiscated. Note: During the aforementioned day, Israeli forces conducted (7) incursions in the following areas and no arrests were reported: Sureef, Beit Kahel, Samou’a and al-Hadab villages in Hebron; Beit Ameen village, southeast of Qalqiliya; and Bita and ‘Aqrabah villages, southeast of Nablus. At approximately 01:30, Israeli forces moved into Hebron and stationed in al-Sha’abah neighbourhood. They raided and searched a house belonging to Khalil Ibrahim al-Ja’bari (27) and arrested him. At approximately 02:00, Israeli forces moved into Bethlehem and stationed in al-Mawaleh Mount in the center of the village. They raided and searched a house belonging to Jawad ‘Awaad and handed his son, ‘Alaa (19), a summons to refer to the Israeli Intelligence Service in “Gush Etzion” settlement, south of the city. At approximately 03:00, Israeli forces moved into Sa’ir, east of Hebron and stationed in al-‘Adeisa area. They raided and searched 3 houses from which they arrested ‘Abed al-Majeed Mohamed al-Shalaldah (21), Waheed Ma’rouf al-Shalaldah (27) and Munadil Khalil Shalaldah (19). At approximately 04:00, Israeli forces moved into Beit Fajjar village, south of Bethlehem. They raided and searched two houses belonging to Fadi Khalid al-Haniny (21) and Omar ‘Ayid Taqatqah (25) and handed them summonses to refer to the Israeli Intelligence Service in “Gush Etzion” settlement, south of the city. At approximately 22:30, an Israeli infantry unit comprised of 150 Israeli soldiers moved into Beit Sira village, west of Ramallah. They raided and searched a house belonging to ‘Ali Rashid Hamdan and handed him a summons to refer to the Israeli Intelligence Service. Note: During the aforementioned day, Israeli forces conducted (6) incursions in the following areas and no arrests were reported: Bani Na’im, Kharas, Kharsa ,Beit ‘Awaa villages and ‘Arqan ‘Awad area in Hebron, and Hijah village, east of Qalqiliya. At approximately 03:30, Israeli forces moved into al-‘Aroub refugee camp, north of Hebron. They raided and searched a house belonging to Abdullah Mahmoud Abu Rayiah (22) and arrested him. Note: During the aforementioned day, Israeli forces conducted (6) incursions in the following areas and no arrests were reported: Bani Na’im, Kharras, Kharsa and Beit ‘Awaa villages and ‘Arqan ‘Awad area in Hebron, and Bitah village, southeast of Nablus. At approximately 01:00, Israeli forces moved into Ya’bod village, southwest of Jenin. They raided and searched a house belonging to Nidal Ya’qoup Abed al-Jabr Enfei’at (27) and arrested him. Around the same time, Israeli forces moved into ‘Alar village, northeast of Tulkarm. They raided and searched a house belonging to Ahmed Hazem “al-Haj Mahmoud” (23) and arrested him. At approximately 03:00, Israeli forces moved into Taqou’ village, southeast of Bethlehem. They raided and searched houses from which they arrested 3 civilians. The arrested persons were identified as Mohamed Khalaf Sabah (25), Ali Diab Sabah (18) and Qusai Hasan al-‘Amour (23). At approximately 03:30, Israeli forces moved into ‘Asirah al-Qabaliya village, south of Nablus. They raided and searched a house belonging to Huzifah Mamoud Hamdan (25) and arrested him. Around the same time, Israeli forces moved into Tulkarm from al-‘Alimi intersection. Israeli vehicles patrolled the streets and then moved into Nour Shams refugee camp, east of the city. They then stationed in al-Mahjar neighborhood, north of the camp. After that, Israeli forces raided and searched a house belonging to a former prisoner Ayman Fouad Ghanam Kanouh (31). At approximately 04:30, Israeli forces moved into ‘Anbta village, east of Tulkarm. They raided and searched 3 houses from which they arrested Ibrahim Ameen Ibrahim al-Najjar (20), Mohamed Tahssin Mohamed Abed al-Dayim (17) and Mohnad ‘Amir Abed al-Raheem Abed al-Dayim (19). At approximately 07:00, Israeli forces accompanied with military vehicles moved about 100 meters into the eastern side of Khuza’ah village, southeast of Khan Yunis, south of the Gaza Strip. Israeli vehicles levelled the area along the fence between the Gaza Strip and Israel. Few hours later, they re-deployed along the fence. At approximately 09:00, Israeli gunboats stationed in northwest of Beit Lahia, north of the Gaza Strip heavily opened fire at Palestinian fishing boats sailing within 4 nautical miles and chased them. Two Israeli gunboats approached a fishing boat belonging to Nabil Mahmoud Baker manned by 5 fishermen. The fishermen were identified as Ihab Jawad Hasan Baker (38), Mamdouh Nu’man Yousef Baker (28), Fadi Mahmoud Sa’id Baker (34) and Nael Nabil Mahmoud Baker (30). All of the abovementioned fishermen are from Southern Remal neighbourhood, west of Gaza City, while Khamis Jihad Sa’id al-‘Arishy (24) is from al-Shati’ camp. Israeli forces obliged the fishermen to take off their clothes, jump into the sea and swim towards the gunboats. After that, they took the fishermen to Ashdod Seaport after confiscating their fishing boat. At approximately 22:00, Israeli forces released the fishermen via Beit Hanoun” Erez” crossing, but kept their fishing boat in custody. In the afternoon, Israeli forces moved into Ya’bood village, southwest of Jenin. They raided and searched a house belonging to Yousef Ahmed Yousef Masharqah (27) and arrested him. Note: During the aforementioned day, Israeli forces conducted (5) incursions in the following areas and no arrests were reported: Beit Sira, west of Ramallah, Nobah and Sa’ir villages, al-‘Aroub and al-Fawar refugee camps in Hebron. At approximately 01:00, Israeli forces moved into Kafur Qaddoum village, northeast of Qalqiliya. Israeli vehicles patrolled the area fired sound bombs and tear gas canisters in the village streets. A gas tear canister fell on a house belonging to Mortadah Barham. As a result, Mortadah’s niece, Farah Yousef Abed al-Raheem (4) suffered tear gas inhalation and was then taken by an ambulance to receive treatment. Few minutes later, the village residents thought that Israeli forces withdrew, but were surprised that Israeli forces were hiding in an abandoned house near the main street. After that, Israeli soldiers arrested Salah ‘Atwah Abed al-Latif Jum’a (23) and took him to an unknown destination. In a new crime of using excessive force, Israeli forces killed a 19-year-old male and wounded 32 others, when moving into al-Fawar refugee camp, south of Hebron. According to PCHR’s investigations, at approximately 01:30, an Israeli infantry unit moved into al-Fawar refugee camp, south of Hebron, from an area adjacent to ” Beit Hagai” settlement and al-Rihiya village, where there was a military camp for them. Around 500 Israeli soldiers, over 50 military jeeps, armed personnel carriers and a bulldozer arrived at the area. After that, they closed the eastern and western entrances to the village and prevented civilians from moving. They also raided and topped houses, in addition to damaging the houses contents, causing fear and horror among residents. Moreover, they locked civilians in one room and confiscated their cell phones. A number of Palestinian young men gathered and threw stones at the Israeli soldiers, who intentionally fired sound bombs and tear gas canisters at them. Furthermore, Israeli soldiers fired live bullets and rubber-coated metal bullets at civilians through holes they made in the houses walls overlooking the sub roads in the village. As a result, 32 civilians were hit with live bullets throughout their bodies. At approximately 16:50, while Israeli forces were stationed in a house belonging to Bajes Mahmoud Ahmed al-Hamouz and locked the family members (7) in one room, the Israeli soldiers made a 30centi-meter hole in the house eastern wall. Through the hole and from a distance of 40 meters, an Israeli soldier fired a live bullet at Mohamed Yousef Saber Abu Hashash (19). The bullet entered under his armpit and settled in his body, while he was on his way out from a building where his grandmother and uncles live. Mohamed was then taken to PRCS, where he received first aid CPR. One of the paramedics classified Mohamed wounds as very serious. He was later pronounced dead due to a bullet that settled in his body, causing internal bleeding. Around the same time, Israeli forces moved into Beit Ummer village, north of Hebron. They raided and searched 3 houses from which they arrested Ward Ibrahim ‘Awad (15), Hamza Ahmed Abu Hashem (18) and Rashid Mousa Salibi (19). At approximately 04:00, Israeli forces moved into Jenin refugee camp adjacent to the city. They raided and searched houses from which they arrested Ahmed Ziyad Ahmed Abu Kharj (22), Mostafa Ibrahim Khadir Saleh “Qaniry” (43) and his son Ahmed (20). Note: During the aforementioned day, Israeli forces conducted (6) incursions in the following areas and no arrests were reported: Howara village, south of Nablus, Heijah village, east of Qalqiliya, and Sa’ir, Beit Olah, al-Hadab and al- Moureq villages in Hebron. At approximately 01:00, Israeli forces moved into Betounia village, west of Ramallah. They raided and searched a house belonging to a leader in Hamas Movement and Hamas representative in the CEC, Hussain Abu Kwaik, and arrested him. Around the same time, Israeli forces moved into al-Am’ary refugee camp in al-Bireh City. They raided and searched houses from which they arrested Nael Mahmoud Isaa Abu Kwaik, Husam Mohamed Naif Khadir, Mohand Ali Hussain Samara, Yousef Yousef Sha’ban Hamad and Jihad al-‘Izaa. At approximately 01:30, Israeli forces moved into Hebron. They raided and searched 3 houses from which they arrested Ahmed Yosor Hasonah, Ahmed Zakaria Miswadah and his brother, ‘Alaa. At approximately 03:00, Israeli forces accompanied with 5 military vehicles moved into Beit Ummer village, north of Hebron. They raided and searched houses from which they arrested Mohamed Khalil ‘Awad (21) and Nour Ibrahim Za’aqiq (19). Moreover, they handed ‘Omar Mohamed ‘Awad (16) a summons to refer to the Israeli Intelligence Service in “Gush Etzion” settlement, south of Bethlehem. Note: During the aforementioned day, Israeli forces conducted (4) incursions in the following areas and no arrests were reported: Ramallah, Bil’in village, west of the city; al-Fawar refugee camp; and Beit Kahel village in Hebron. Following the Friday prayer, on 12 August 2016, Palestinian civilians and Israeli and international human rights defenders organized a protest in the center of Kufor Qaddoum village, northeast of Qalqiliya, and then made their way to the eastern entrance of the village in protest against closing that entrance since the beginning of al-Aqsa Intifada with an iron gate. When the protesters approached the entrance, Israeli forces fired live bullets, rubber-coated metal bullets, tear gas canisters and sound bombs at them. As a result, many civilians suffered tear gas inhalation and the main water line and electrical transformer were damaged due to spraying wastewater at them. Two gas canisters fell on a house belonging to Tayseer Abed al-Rahim Ishteiwi and at the entrance of Omar Ibin al-Khatab mosque. As a result, many civilians suffered tear gas inhalation as well. Following the Friday prayer, dozens of Palestinians and Israeli and international human rights defenders organized protests against the annexation wall and settlement activities in Bil’in and Ni’lin villages, west of Ramallah and al-Nabi Saleh village, northwest of the city. The protests were organized in solidarity with prisoner Bilal Kayid, who has been on hunger strike for the 3rd Israeli forces fired sound bombs and tear gas canisters to disperse the protesters. As a result, many civilians suffered tear gas inhalation while others sustained bruises as Israeli soldiers beat them up. At approximately 15:00, on 12 August 2016, dozens of Palestinian young men headed to the border fence between the Gaza Strip and Israel, east of al-Burij refugee camp, in the central Gaza Strip. They threw stones at Israeli soldiers stationed behind sand barriers. The Israeli soldiers fired live bullets and tear gas canisters at the protesters. As a result, Khalid Taha Mohamed Hijazi (32) was hit with a live bullet to the left leg and then taken to al-Aqsa Hospital in Deir al-Balah to receive medical treatment. Khalid wounds were classified as moderate. Rubber-coated metal bullets are lethally if they hit the head of victim from a close range. At approximately 00:15 on Monday, 15 August 2016, Israeli forces accompanied with military vehicles moved into Bani Na’im, east of Hebron, and stationed in the eastern side of the village. They raided and searched houses and forced the inhabitants to vacate their houses under the pretext exploding a house belonging to Nasir Mohamed Tarayrah (50), whose son killed an Israeli female settler inside her house in “Givat Kharsina” settlement, on 30 June 2016, and was killed as well. After putting all the above mentioned families in one house, an Israeli explosive engineering team transplanted explosive devices in the house’s 1st floor and remotely blew it up. As a result, the windows of nearby houses broke. It should be mentioned that the 2-stroey house is built on an area of 200 square meters. The explosion on the first floor caused cracks in the second floor. Israel has continued to close the BeitHanoun (Erez) crossing for the majority of Palestinian citizens from the Gaza Strip. Israel only allows the movement of a limited number of groups, with many hours of waiting in the majority of cases. Israel has continued to adopt a policy aimed at reducing the number of Palestinian patients allowed to move via the BeitHanoun crossing to receive medical treatment in hospitals in Israel or in the West Bank and East Jerusalem. Israel also continued applying the policy of making certain civilian traveling via the crossing interviewed by the Israeli intelligence service to be questioned, blackmailed or arrested. On Tuesday, 09 August 2016, Israeli forces allowed the exportation of 35.3 tons of tomatoes, 44.10 tons of cucumber, 2tons of eggplant and 2 tons of cabbage. On Wednesday, 10 August 2016, Israeli forces allowed the exportation of 40 tons of iron scrap and 36 tons of aluminum scraps. On Thursday, 11 August 2016, Israeli forces allowed the exportation of 11.3 tons of tomatoes, 2 tons of eggplants and 23.7 tons of cucumber. On Friday, 12 August 2016, Israeli forces allowed 238 persons and from the Gaza Strip to perform prayers in al-Aqsa Mosque in Jerusalem. On Thursday, 11 August 2016, Israeli forces allowed 3 persons and on Monday, 15 August 2016, 5 persons working in the Civil Affairs Department to attend a meeting at the crossing. On Sunday, 14 August 2016, Israeli forces allowed 7 persons to renew their permits. On Thursday, 11 August 2016, Israeli forces established 3 checkpoints at the southern entrance to Hebron and the entrances to Bani Na’im, and al-Galagel villages. On Friday, 12 August 2016, Israeli forces established 2 checkpoints at the northern entrance to Halhoul and Sa’ir villages. On Saturday, 13 August 2016, Israeli forces established checkpoints at Farsh al-Hawa road_ bypass road (35), al-Surrah and al-Thaheriyah villages. On Sunday, 14 August 2016, Israeli forces established 3 checkpoints at the abovementioned areas. On Monday, 15 August 2016, Israeli forces established 2 checkpoints at the southern entrance to Hebron and the northern entrance to Yatta. On Wednesday, 17 August 2016, Israeli forces established 3 checkpoints at the entrances to al-Fawar and al-Aroub refugee camps and al-Mawreq village. Ramallah: Israeli forces established (6) checkpoints all over the city. At approximately 16:00 on Saturday, 13 August 2016, Israeli forces established a checkpoint at the intersection of Ein Senia, north of Ramallah. At approximately 22:30, they established a similar checkpoint near the bridge of Atarah village, at the northern entrance to Birzeit, north of the city. On Monday, 15 August 2016, Israeli forces established 2 checkpoints near the bridge of Atarah at the northern entrance to Birzeit village and under the bridge of Yabrud village, northeast of the city. On Tuesday, 16 August 2016, Israeli forces established 2 checkpoints in which the first was near the bridge of Atarah at the northern entrance to Birzeit village, north of Ramallah and the second at the western entrance to Selwad village, northeast of the city. On Friday, 12 August 2016, Israeli forces established a checkpoint at the entrance to Azzoun village, east of Qalqiliyah. During which they checked the civilians ID cards and searched their cars. They then detained four civilians, including 2 children and they are namely as Osama Bilal Saleh Suwaidan (17), Ali Husam Ali Suwaidan (17) Saleem Redwan, Hassan Saleem Redwan. Later, the Israeli forces released them. At approximately 00:30 on Saturday, 13 August 2016, Israeli forces established a checkpoint at the entrance to Qarawet Bani Hasan village, northwest of Salfit. At approximately 19:30, Israeli forces established a similar checkpoint near the entrance of the abovementioned village. At approximately 20:00 on Friday, 12 August 2016, Israeli forces established a checkpoint under the bridge of a-Zawiyah village, west of Salfit. At approximately 23:40, Israeli forces established a checkpoint between Kafer al-Deek and Deir Ghasanah villages, west of the city. At approximately 14:30 on Monday, 15 August 2016, Israeli forces established a checkpoint at the entrance to al-Zawiyah village. At approximately 22:20, they established a similar checkpoint at the entrance to Bruqin village, west of Salfit. After the Israeli forces closed the sub-roads of Adula and Ourta villages and Hawarah, south of Nablus on Thursday, 11 August 2016, the Israeli forces stationed at Za’tarah and Hawarah checkpoints and Beta crossroad were closing the three checkpoints every now and then. As a result, the civilians suffered of hindrances as they wait for long hours, because there were not alternative or sub-roads to be used. The Israeli forces continued their abusive practices so far. A PCHR’s fieldworker said that they close the checkpoints between 18:00 and 21:00 every day. At approximately 11:30 on Monday, 15 August 2016, Israeli forces established a checkpoint at the crossroad of Dar Sharaf village, northwest of Nablus. At approximately 17:30, they established a checkpoint at the crossroad of Jama’in village, south of the city. At approximately 18:00 on Thursday, 11 August 09 August 2016, Israeli forces stationed at Enab checkpoint established at the road that links between Tulkarm and Nablus, east of Tulkarm, has tightened its arbitrary measures against Palestinians and obstructed their way. The tightening has repeated at approximately 08:00 on Friday, 12 August 2016 and at approximately 20:00 and approximately 08:00 on Saturday, 13 and approximately 08:00 on Sunday, 14 August 2016. At approximately 13:30 on Friday, 12 August 2016, Israeli forces established a checkpoint at the road that links between Tulkarm and Qalqiliyah near Jabarah village, south of Tulkarm. At approximately 13:30 on Saturday, 13 August 2016, Israeli forces established a checkpoint at the road that links between Tulkarm and Nablus near the crossroad of Beit Led village, east of Tulkarm. At approximately 14:00 on Sunday, 14 August 2016, the established the checkpoint in the abovementioned area again. Jenin: Israeli forces established (4) checkpoints all over the city. At approximately 11:00 on Friday, 12 August 2016, Israeli forces established a checkpoint at the crossroad of al-Zawiyah village, south of Jenin. At approximately 19:30, they established a similar checkpoint at the eastern entrance to Ya’bud village, southwest of the city. At approximately09:30 on Saturday, 13 August 2016, Israeli forces established a checkpoint at the entrance to Ya’bud village, southwest of Jenin. At approximately 18:00, Israeli forces established a similar checkpoint at the entrance to Kfirt village, southwest of the city. At approximately 16:00 on Friday, 12 August 2016, Israeli forces arrested Ahmed Abdul Qader Abu Awed (40), a coordinator in the Popular Front in al-Fawar refugee camp, south of Hebron. They stopped him while driving on his way back home at “Gush Etzion” settlement intersection, south of Bethlehem. At approximately 20:00 on Sunday, 14 August 2016, Israeli forces stationed at Turah checkpoint- Um al-Raihan arrested Jamal Mohammed Khader Qabhah (64), his daughter Amal (15) and wife Nawal (39) when they were passing through the checkpoint. According to investigations conducted by PCHR’s field workers, at approximately 20:00, Jamal and his family were driving back from Ya’bod village, southwest of Jenin, to Um al-Raihan village that is isolated from other villages due to the annexation wall, west of Jenin. When they reached the checkpoint, Jamal’s wife got out of the car and walked through the lane of pedestrians while Jamal walked through the cars lane along with his daughter Amal. After an Israeli female soldier searched the trunk, she opened the door where the child was and shouted that she stabbed her. Jamal was talking with a soldier when he heard the female soldier shouting in Hebrew that his daughter stabbed her and ordered him to get out of the car and see. Jamal found a knife thrown on the ground while his daughter was standing motionless. After that, the female soldier handcuffed the girl and arrested Jamal and his wife as well. The arrested family members were taken to a military camp near the checkpoint where the Israeli intelligence services investigated them. Later, Israeli forces released Jamal and his wife, but kept their daughter under arrest. At approximately 15:00 on Monday, 15 August 2016, Israeli forces arrested Yusuf Mohammed Husain Braighith (50) and his son Mohammed (21) when they were at their shops on Jerusalem – Hebron Road, east of Beit Ommar village, north of Hebron. At approximately 18:00 on Monday, Israeli forces established a checkpoint near Hadad Tourism village, southeast of Jenin. They stopped the cars and checked the passengers’ ID cards. They then arrested Mohammed al-Mo’tasem Bellah Husain Abu al-Hasan (18) from Jenin. On the evening, Israeli forces stationed at Salem military checkpoint established near Romanah village, northwest of Jenin, arrested Momen Mahmud Mohammed Sabagh (21) from Jenin refugee camp near the city. According to a PCHR’s fieldworker, Momen was arrested when he was passing through the checkpoint where he was taken to an unknown destination. On Tuesday morning, 16 August 2016, Israeli forces stationed at the gate of the annexation wall established at the entrance to the Eastern Barta’ah village isolated from other villages due to the wall, west of Jenin, arrested Mohammed Nasser Abdul Hafez Alaqmah (27) from Barta’ah village, when he was crossing the checkpoint. At approximately 00:00 on Thursday, 11 August 2016, Israeli forces raided and searched a house belonging to Ahmed Aseelah in al-Hadeed Gate neighbourhood, one of the Old City villages in East Jerusalem. They then arrested his son Eyad (17). At approximately 01:00, Israeli forces raided and searched a house belonging to Najib al-Zahgal in Ein al-Lawzeh neighbourhood in Silwan village, south of Jerusalem’s Old City. At approximately 18:00, Israeli moved into several neighbourhoods in Silwan village, south of Jerusalem’s Old City. They deployed in Ein al-Lawzah neighbourhood, al-Wustah neighbourhood and Turbet al-Sawahrah where they established checkpoints and checked the young men’s ID cards. At the meantime, a number of young men threw fireworks at the soldiers who closed the main streets and began raiding and searching several houses. Two of these houses belong to al-Abasi and al-Rajabi families in Ein al-Lawzeh neighbourhood. The Israeli soldiers also attacked and beat Alaa’ Qara’in (45) while passing by the area. As a result, he fainted and suffered bruises throughout his body. At approximately 01:00 on Friday, 12 August 2016, Israeli forces raided and searched several houses in the Old City in Jerusalem. They arrested 14 civilians as they raided and searched their houses. The Israeli forces took them to al-Qishlah police centre in the Old City where they were told to be denied access to al-Aqsa mosque for two weeks. They also kept in custody some of the ID cards of the arrested persons. The arrested civilians were identified as Ibrahim al-Natshah, Ma’moun al-Shawish, Mohammed al-Bayoumi, Omer al-Za’anin, Abdullah Da’nah, Mohammed Arafah, Obadah Najib, Ahmed al-Shawish, Mohammed Abu Farha, Ahmed al-Razem Mohammed Najib, Saed Aseelah, Laith Ghaith. At approximately 03:00 on Saturday, 13 August 2016, Israeli forces moved into several houses in the Old City in East Jerusalem. They raided and searched a number of houses. They then arrested 9 civilians and took them to al-Qishlah police centre in the Old City. The arrested civilians were identified as Morad al-Ashhab, Alaa’ al-Falhuri, Wesam Hijazi, Alaa’ Jamjoum, Ahmed Abu Ghazalah, Mohammed Abu Shushah, Yusuf Abu Shushah, Sami al-Rajbi and Mustafa al-Haslamun. At the meantime, this arrest campaign came along with calls by the so-called “Temple Organizations” Coalition upon Israeli settlers to participate in wide raids of the mosque. At the same time, there were festivals held by these organizations to commemorate the anniversary of “Tisha B’av”. At approximately 13:00, Israeli forces arrested Aseel Omran Salah Eidin (12) when they were passing through al-Amoud Gate area in the Old City in East Jerusalem. At approximately 13:00 on Monday, 15 August 2016, Israeli forces and municipality crews raided Wadi Helwah information centre in Silwan, south of Jerusalem. They handed Jawad Siam, head of the centre, a summons to investigate with him. PCHR’s fieldworkers said that Israeli forces suddenly raided the centre and took photos for the posters hanged on the wall. They also took photos for a chain that is used to protect children when they leave the centre. It should be mentioned that the centre put a chain few months ago to protect children from getting run over because the Israeli municipality does not care about the safety needs for civilians. At approximately 01:30 on Tuesday, 16 August 2016, Israeli forces raided and searched a house belonging to Saleh Hijazi in al-Mukaber Mount neighbourhood, southeast of Jerusalem. They then arrested Saleh’s son, Ashraf (22). At approximately 18:30 on Tuesday, 16 August 2016, Israeli forces raided the office of the Red Crescent in al-Shaikh Jarah neighbourhood, north of the Old city in Jerusalem. They forcibly dispersed participants in the sit-in held in solidarity with the prisoners on hunger strike. The Jerusalemite Prisoners Families Committee and Prisoner Club in Jerusalem said that armed Israeli police accompanied with police dogs raided the office of the Red Crescent and ordered the protestors to vacate the place claiming that the Administration of the Red Crescent complained against the protestors that they raided the office by force to organize the sit-in. The Israeli force used forces to disperse the protestors, who are families of prisoners and solidarity persons, and checked the ID card of Amjad Abu Asab, Head of the Jerusalemite Prisoners Families Committee. The police threatened to arrest whoever attempts to protest inside the office. At approximately 06:30 on Thursday, 15 August 2016, Israeli forces accompanied with several military jeeps and a bulldozer moved into Barta’ah Eastern village that is isolated due to the annexation wall, west of Jenin from the southern side. They surrounded the area and announced it as a closed military zone. The bulldozer demolished a livestock Barrack used as a granite factory and belongs to Walid Ahmed Mohammed Ajaj (32) from Saida village, north of Tulkarm. Following the demolishment, the Israeli forces confiscated an air pump, forklift and a small tractor. The bulldozers then demolished another livestock barrack belonging to Rami al-Ayoubi from Kafer Qasem. At approximately 19:00 on Monday, 15 August 2016, Israeli forces confiscated a bulldozer in the area between Turmus’ayya and Sanjal villages, north of Ramallah, belonging to Hamzah Saleh Abed Arouri. Hamzah was establishing a road in al-Bassah area for farmers to facilitate their way to their farms, but the Israeli forces raided the area and confiscated the bulldozer. Ahmed Mohammed al-Shalaldah: his family consists of 6 individuals, including 2 children. Fares Yasen Shalaldah: his family consists of 10 individuals, including 6 children. The demolition included a livestock barrack belonging to Ibrahim Mohammed Mustafa Shalaldah and used to graze sheep. The barrack cost around NIS 100,000 and shelter 100 sheep. At approximately 05:00 on the same day, the Israeli bulldozers demolished 3 houses belonging to Mousa Mohammed Ahmed Zarenah behind the annexation wall in Beir Ounah area, north of Beit Jala. Mohammed Zarenah, the owner’s son, said to a PCHR’s fieldworker that Israeli forces accompanied with several military jeeps and a bulldozer moved into the abovementioned area and demolished the houses without a prior warning. Two of the houses are about 120 square meters while the third, which is a big room, is about 45 square meters. He also said that 20 persons live in those houses. He also mentioned that the bulldozers levelled the land after the demolition and uprooted a number of trees. At approximately 02:00 on Wednesday, 17 August 2016, Israeli forces accompanied with military jeeps and a bulldozer moved into Ras al-Aqraa’ area, southwest of Duma village, southeast of Nablus. The bulldozer demolished a 100-square-meter inhabited house belonging to Tareq Saleh Redwan Saidawi. They also demolished the house because it is located in Area (c). It should be mentioned that Saidawi is from Jerusalem and lives in al-Ram. At approximately03:00, Israeli forces accompanied with military jeeps and a bulldozer moved into Marah Ethnain area, south of Qasrah village, southeast of Nablus. The bulldozer demolished an agricultural room belonging to Samir Ibrahim Mustafa Hasan. The room, which is about 16 square meters, was demolished because it is located in Area (c). At approximately 21:30 on Saturday, 13 August 2016 a group of settlers under the Israeli protection raided the antiquities area in Sebastiyah village, northwest of Nablus. They performed religious rituals in the area until the next day dawn, Sunday 14 August 2016. After that, the settlers and the Israeli forces withdrew without reporting more incidents. At approximately 08:40 on Sunday, 14 August 2016, hundreds of Israeli settlers raided al-Aqsa mosque in the Old City in East Jerusalem under special protection of the Israeli forces to commemorate the so-called Destruction of the Temple. The Islamic endowments (Waqf) Department mentioned that 400 settlers raided al-Aqsa mosque during the raids period (306 settlers raided the mosque in the morning while 94 others raided it in the evening). The Waqf said that the settlers raided the mosque from al-Magharbah Gate, had a tour in its yards and left through al-Selsilah Gate. They also performed prayers near the mosque door. The police then forced a group of settlers to leave the area after the mosque guards rejected the settlers provoking behaviour. It should be mentioned that the Israeli forces arrested Tahah Shawahnah and Asalah Hujair and handed them a decision to deny them access to al-Aqsa mosque for two weeks. At approximately 20:30 on Sunday, a group of settlers attacked and beat Abdul Rahman Khalid Shuwaiki (13) when he was selling bread at the entrance to Wadi Helwah neighbourhood in Silwan village, south of Jerusalem’s Old City. Abdul Rahman said to a PCHR’s fieldworker that 3 settlers driving a car got out of the car and spoke to him in Hebrew language, but he did not understand them. One of them tore his shirt and then pushed him on the ground and beat him throughout his body. He added that the settlers ran away from the area, and a young man then ran towards him to help him. on Monday, 15 August 2016, Israeli forces closed Khan Al Ahmar mixed Primary school in Bedouin communities established in East Jerusalem claiming it is located in an not hygienically safe environment with the Israeli controlled Area (c). Khames Abu Dahuk, Spokesperson of the Bedouin Communities in al-Khan al-Ahmer, said that Netanyahu’s office has issued a decision to close al-Khan al-Amer school that is known as al-Ejal School after he called the Italian Ambassador and informed him of the decision to close the school. Abu Dahuk also said that the Israeli authorities claimed that the school in not legal as it’s established in an environment that is not hygienically safe in area that is under the Israeli control. He emphasized that the school was built in 2009 with the help of Palestinian and foreign volunteers. In the 2016-2017 scholar year, the school will include 170 students coming from five Bedouin communities in East Jerusalem. Abu Dahuk added that al-Khan al-Ahmer school is one of four other schools that are targeted by the civil administration of the Israeli forces. He clarified that closing this school to demolish it paves the way to demolish the rest of the schools which means that the children of the Bedouin communities would not be able to receive education any more. It should be mentioned that Israeli authorities target the area of the Bedouin communities to establish more settlements on Palestinian lands. At approximately 07:00 on Tuesday, 16 August 2016, Israeli military jeeps demolished a commercial facility in Anata village, northeast of Jerusalem. This facility, which was demolished under the pretext of building without a permit, belongs to Zakariya Mousa. Mousa said to a PCHR’s fieldworker that the Israeli forces moved into the village and surrounded his car shop and demolished it in addition to a 40-square-meter room, which was built of tin plates and used as offices. Mousa mentioned that this facility was built a year ago where 15 individuals make their living of it. He also said that the demolition included the office contents and two cars as the Israeli forces did not allow him to vacate any of which. He added that the bulldozers demolished without a prior warning. It should be noted that the Israeli authorities handed demolition notices for many facilities two months ago. At approximately 09:00, Israeli bulldozer demolished a room and walls that belong to Mohammed Obaidat in Khelet Abed area in al-Sal’ah neighbourhood in al-Mokaber Mount village, southeast of East Jerusalem, claiming that it was built without a permit. Mohammed said that Israeli Special Forces surrounded the area and gave him 10 minutes to vacate the contents of the house and then demolished the house. He said that he built a room of tin plates on an area of 40 square meters in last July. A month ago, the municipality crews raided the room and hanged the demolish notice, so he transformed it to a stable for horses. However, he was surprised when the Israeli forces raided the room and demolished it and the fences around his land.